Terror Rupes is the long, cliff-like landform visible at the center of this photograph of Mercury. Terror Rupes is one of Mercury's most prominent lobate scarps. Image acquired Feb. 4, 2012. Explosive volcanic eruptions apparently shaped Mercury's surface for billions of years — a surprising finding, given that until recently scientists had thought the phenomenon was impossible on the sun-scorched planet. This discovery could shed new light on the origins of Mercury, investigators added. Two pyroclastic vents on the floor of Mercury’s Kipling crater, top, would likely not have survived the impact; they are more recent. The false color image of the same spot, bottom, marks pyroclastic material as brownish red. Explosive volcanism happens because Earth's interior is rich in volatiles — water, carbon dioxide and other compounds that vaporize at relatively low temperatures. As molten rock rises from the depths toward Earth's surface, volatiles dissolved within it vaporize and expand, increasing pressure so much that the crust above can burst like an overinflated balloon. Mercury was long thought to be bone-dry when it came to volatiles. As such, researchers thought explosive volcanism could not happen there. However, in 2008, after the initial flyby of Mercury by NASA's MESSENGER spacecraft (short for MErcury Surface, Space ENvironment, GEochemistry, and Ranging), researchers found unusually bright reflective material dotting the planet's surface. This stuff appears to be pyroclastic ash, which is a sign of volcanic explosions. The large number of these deposits suggested that Mercury's interior was not always devoid of volatiles, as scientists had long assumed. It was unclear from MESSENGER's first flybys over what time periods those explosions had occurred. Now scientists find Mercury's volatiles did not escape in a rash of explosions early in the planet's history. Instead, explosive volcanism apparently lasted for billions of years on Mercury. Investigators analyzed 51 pyroclastic sites across Mercury's surface using data from MESSENGER collected after the spacecraft began orbiting around the innermost planet in the solar system in 2011. These orbital readings provided a far more detailed view of the deposits and the vents that spewed them out compared with data from the initial flybys. The orbital data revealed that some of the vents were much more eroded than others. This revealed the explosions did not all happen at the same time. If the explosions did happen over a brief period and then stopped, "you'd expect all the vents to be degraded by approximately the same amount," study lead author Timothy Goudge, a planetary scientist at Brown University, said in a statement. "We don't see that; we see different degradation states. So the eruptions appear to have been taking place over an appreciable period of Mercury's history." The researchers noted that about 90 percent of these ash deposits are located within craters formed by meteorite impacts. These deposits must have accumulated after each crater formed; if a deposit were laid down before a crater formed, it would have been destroyed by the impact that formed the crater. 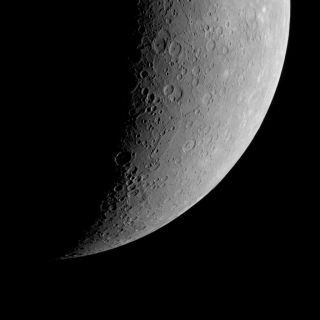 "The most surprising discovery was the range of ages over which these deposits appear to have formed, as this really has implications for how long Mercury retained volatiles in its interior," Goudge told Space.com. Earlier models of how Mercury formed suggested most of its volatiles would not have survived the planet-formation process. For instance, since Mercury has an unusually large iron core, past models posited that the planet might have once been much larger, but had its outer layers and its volatiles removed by a huge impact early in the planet's history. This scenario now seems unlikely given these new findings, in combination with other data collected by MESSENGER showing traces of the volatiles sulfur, potassium, and sodium on Mercury's surface. Future research will aim to identify more of these pyroclastic deposits and their source vents. "More detailed observations and studies of single vents and associated deposits will elucidate some of the detailed aspects of what pyroclastic activity might have been like on Mercury," Goudge said. The scientists detailed their findings online March 28 in the Journal of Geophysical Research: Planets.